The Pankha Road 1.5 Km flyover (popularly known as Dabri flyover) launched in 2009 at an cost of Rs.109.84 Cr. The flyover was to be ready by September 2011 but delayed due to shifting of underground water pipelines by Delhi Jal Board and overhead High-Tension cables and other illegal structures around Dabri crossing. This flyover was suppose to ease traffic in this region (Dabri crossing) of South-West Delhi and particularly for those residing at Dwarka, Janakpuri and Uttam Nagar. It was proposed to open this flyover for trial run on August 15, 2012 after missing the initial deadline of September 2011. The same could not be complied with keeping in view safety of commuters. The slip road for Dwarka has just started (October, 2012). Traffic is now moving on this flyover to and fro UttamNagar and Sagarpur. 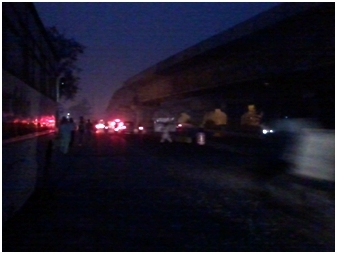 This stretch has no street lights, what to talk about lights on the flyover. In the picture, it is difficult to find a single street light right from DESU colony upto the end of the flyover – a distance of around 2+ Kms. Parking of buses along the flyover near Raghu Nagar is an additional woe on this stretch for road users. Who and which authority will be held responsible in case any mishap happen on and around this under-construction flyover? This situation of no street lights is prevailing for more than 6 months and nobody is bothered about the safety of the road users, so the claim of SDMC about safety of commuters is just a hoax. In case any responsible officer of SDMC, other agency or the construction company goes through this. May take urgent remedial measure in larger interest of road users keeping in mind their safety. An email has been sent to Commissioner, MCD, SDMC on this issue and hope action will be initiated.